Reform issues of many stripes gained the attention of the public and politicians in the early twentieth century. Advocates for child welfare formed one of the most vocal segments this trend. The establishment of the U.S. Children’s Bureau in 1912 marked a high point in the effort by many Americans to improve the lives of children. Activist Florence Kelley recalls that she and Lillian Wald discussed the idea for a federal agency dedicated to childrens issues over breakfast one morning in 1903. Wald lamented that the government spent money and time on raising agricultural crops and animals, but ignored the needs of children. The two women collaborated with other leaders also interested in child welfare. The most visible anti-child labor group, the National Child Labor Committee, endorsed the children’s bureau idea in 1905, gaining the private support of President Theodore Roosevelt. Nonetheless, the president did not take the idea to congress. As one of his last acts as president, Roosevelt finally gave the idea a boost by calling the January, 1909 White House Conference on the Care of Dependent Children. Participants at this meeting passed a resolution of support for the proposal and over the next three years lobbied congress. The Senate passed the bill establishing the U.S. Children’s Bureau bill by a vote of 54 to 20 and the House approved 177 to 17. 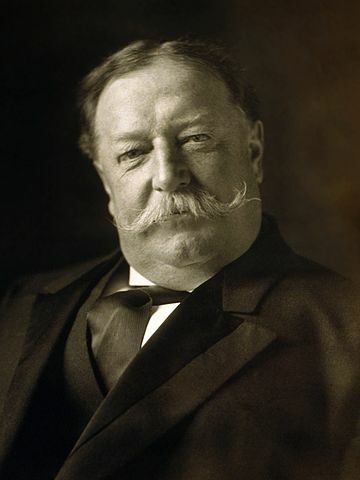 President William Howard Taft signed the legislation on April 8, 1912 (Stat. L, 79) placing the new agency within the Department of Commerce and Labor. Taft’s signature made the United States the first nation in the world to have a federal agency focused solely on children. The president’s named Julia C. Lathrop the bureau’s first chief, symbolizing the important role women had played in the agency’s creation. Lathrop was the first women named to head a federal agency in the United States; notably eight years before the passage of national female suffrage. The Children’s Bureau was very popular with the public, but still faced some powerful critics. Manufacturing interests feared that the bureau would push for the elimination of child labor. Fiscal conservatives contended that the bureau duplicated work already under the jurisdiction of other federal agencies (primarily the U.S. Public Health Service and the Bureau of Education). The Catholic Church warned that the Children’s Bureau might interfere with parochial education, promote birth control, or interfere with parental authority. Lathrop sought to quiet criticism by steering clear of partisan politics and the most controversial political issues. As chief, Lathrop chose to use the Children’s Bureau to promote the middle-class family ideal: a nuclear family where the father worked as the sole breadwinner, mother served full-time as a housewife, and children attended school, were well-fed and cared for, had a secure future, and labored only at household chores. Initially she avoided the issue of child labor and instead chose to center bureau efforts on lowing the nation’s high infant mortality rate and denied any connection to the controversial birth control movement. Faced with a small staff of only fifteen and a miniscule budget of $25,640, the U.S. Children’s Bureau’s relied on data collected by other federal agencies and an army of female volunteers. In 1913 the bureau found that the world’s largest economic power had an infant mortality rate of 132 deaths per 1,000 live births that placed it behind New Zealand (83), Norway (94), Ireland (99), Sweden (104), Australia (108), Bulgaria (120), and Scotland (123). Bureau investigators concluded that poor sanitation, lack of good medical care, and poverty were the major factors contributing to infant deaths. Educating mothers, improving public sanitation, and requiring birth certificates would help save babies’ lives. Advice pamphlets published by the bureau became very popular and Congress declared 1918 Children’s Year. In 1921 Congress passed the Sheppard-Towner Maternity and Infancy Act, giving the Children’s Bureau administrative authority over the program. Although limited to education, diagnosis, and investigation, by 1926 the Sheppard-Towner Act faced strong opposition from the American Medical Association which condemned the program as socialized medicine. The fight was also a turf war between the Public Health Service and the bureau. Administering the program through two staff physicians, Grace L. Meigs (hired in 1915) and Dorothy Reed Mendenhall (hired in 1917) was not enough to pacify the AMA. Funding for Sheppard-Towner ended in 1929, but infant mortality rates had decreased to 67.9 deaths per 1,000 live births. The onset of the Great Depression was especially hard on children, but the new political atmosphere opened new opportunities for the Children’s Bureau to implement it’s a broader agenda on behalf of children. Under Herbert Hoover the Children’s Bureau had been weakened, but Franklin Roosevelt’s election brought the plight of children into focus. Three representatives from the Children’s Bureau, Katharine Lenroot, Martha May Eliot, and Grace Abbott wrote the seminal child welfare sections of the 1935 Social Security Act. Title V provides federal funding for maternal and infant care for low-income mothers and children. During World War II Title V was expanded to include medical care for the wives and newborns of enlisted men in the military. From 1942 to 1946 one of every seven babies born in the United States benefited from this Emergency Maternity and Infant Health Program. The 1935 Social Security Act also included the Aid to Dependent Children Program (ADC, later renamed Aid to Families with Dependent Children and eliminated in 1996 under President Bill Clinton’s Welfare Reform Act), and Title VII that created federal allocations for handicapped children. As some of its critics had feared, after its initial work on infant mortality, the Children’s Bureau also worked to eliminate child labor. The 1910 census counted 1,990,225 children under fourteen years of age working for wages (18.4 percent of the total age cohort). In 1915 the bureau began lobbying against the worst abuses of workers under age eighteen. Congress responded by passing the Keating-Owen Act in 1916, but the U.S. Supreme Court rejected the law in 1918. Congress passed an anti-child labor constitutional amendment in 1922, but the measure was never ratified by the necessary number of states. It took the onset of high adult unemployment rates in the 1930s to change the political and legal atmosphere in favor of federal child labor regulation. Congress passed he first permanent federal restrictions on child labor as part of the 1938 Fair Labor Standards Act. The U.S. Children’s Bureau enforced the federal prohibitions that kept youngsters under fourteen out of the wage-labor force and regulated the participation of adolescents under eighteen. In its first decades of work the Children’s Bureau also shaped policies concerning minors who entered the nation’s justice system or otherwise depended on the government for their support. By 1920 forty-five of the then forty-eight states had some form of juvenile or family court. The establishment of juvenile justice systems were a clear recognition of the middle-class ideal that set childhood aside as a distinct period of life separate from adult responsibilities. In an interesting turn of events, the growing role for the federal government in child welfare did not translate to an ever expanding role for the U.S. Children’s Bureau. The Social Security Board (established in 1935) was given authority for administering ADC and the Public Health Service handled Title V’s maternal and child health program. In 1946 the Truman Administration’s government reorganization lowered the Children’s Bureau status within the federal hierarchy and set the stage for the eventual removal of all administrative and regulatory responsibilities from the agency. Symbolically, the change removed the “U.S.” from the agency’s name. The Children’s Bureau’s became solely a clearing house for information on child welfare. Following Julia C. Lathrop (1912-1921), the Children’s Bureau was headed by Grace Abbott (1921- 1934), Katharine F. Lenroot (1934-1951), Martha May Eliot (1951-1956), and Katherine B. Oettinger (1956-1969). The bureau relocated again within the federal hierarchy in 1969, this time to the new Office of Child Development in the Department of Health, Education, and Welfare. Frederick C. Green, served as acting chief when Oettinger stepped down in 1969 and marked the first time a man headed the agency. President Richard M. Nixon appointed Edward F. Zigler chief in 1972, making him the first African American and male to officially sit as chief of the Children’s Bureau. Goodwin, Joanne L. 1997. Gender and the Politics of Welfare Reform: Mothers’ Pensions in Chicago, 1911-1929. Chicago: University of Chicago Press. Ladd-Taylor, Molly. 1986. Raising Baby the Government Way: Mothers’ Letters to the Children’s Bureau, 1915-1932. New Brunswick: Rutgers University Press. Lemons, J. Stanley. 1973. The Woman Citizen: Social Feminism in the 1920s. Urbana: University of Illinois Press. Lindenmeyer, Kriste. 1997. “A Right to Childhood”: The U.S. Children’s Bureau and Child Welfare, 1912-1946. Urbana: University of Illinois Press. Lindenmeyer, Kriste. 2005. The Greatest Generation Grows Up: American Childhood in the 1930s. Chicago: Ivan R. Dee. Meckel, Richard. 1989. Save the Babies: American Public Health Reform and the Prevention of Infant Mortality, 1850-1929. Baltimore: Johns Hopkins University Press. Michel, Sonya. 1999. Children’s Interests/Mothers’ Rights: The Shaping of America’s Child Care Policy. New Haven: Yale University Press. Muncy, Robyn. 1991. Creating a Female Dominion in American Reform, 1890-1935. New York: Oxford University Press. Trattner, Walter I. 1970. Crusade for Children: A History of the National Child Labor Committee and Child Labor Reform in America. Chicago: Quadrangle Books.